Hurray! 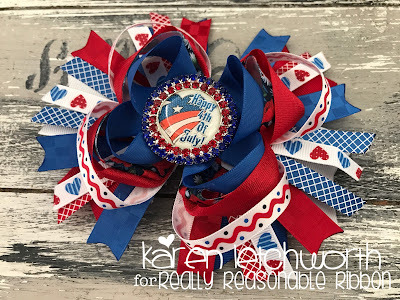 It's time once again for the Really Reasonable Ribbon Blog Hop, and this month's Ribbon Club Assortment is an AMAZING patriotic collection to help you create some fun red, white and blue projects to celebrate our AWESOME country as we approach the 4th of July. You should have arrived here by way of Bonnie's Blog; but if not, you can easily get started on the hop. Just look at this beautiful collection of ribbons! This hair bow incorporates all but one of the ribbons found in this month's Ribbon Club Assortment including a length of the 3/8" Crosshatch on Red Satin Ribbon, 5/8" Royal Blue Checkerboard Satin Ribbon, 3/8" Patriotic Zig Zag on White Satin Ribbon, 5/8" Delicate Stitched Red Satin Ribbon, 5/8" Royal Blue Taffeta Ribbon, 3/8" Patriotic Candy Hearts on White Grosgrain Ribbon, 5/8" Checkerboard Red Satin, and 3/8" Royal Blue Crosshatch Satin Ribbon. The bow is secured on the back with a French Clip. And just like ALL of Really Reasonable Ribbon's trims, they all work SO well together. 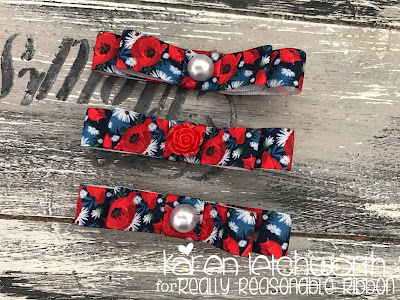 I'd also like to share some cute little barrettes with you that were created using the one ribbon that wasn't incorporated into the bow; and that would be the GORGEOUS 5/8" Red Poppy Print Satin Ribbon, along with some Red Open Roses and White Flatback Pearls in the center of each barrette. These barrettes are secured with Single Prong Alligator Clips. The next stop on this Blog Hop is at the blog of my talented teammate, Kathy. She will most definitely have something extra awesome to share with you all. 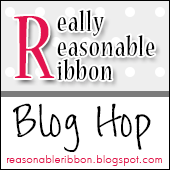 And don't forget to stop at each blog to leave a comment, and then finally....answer the question at the end of the hop on the Really Reasonable Ribbon Blog. 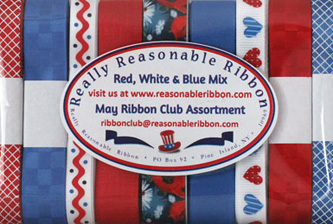 One lucky person will WIN this month's Ribbon Club Assortment! We hope that you will check out the Ribbon Club Assortment and ALL of the wonderful products available at Really Reasonable Ribbon. Such sweet barrettes and hair bow! Very pretty! I am in love with the red poppy ribbon! Love those sweet barrettes. Your hairbows are always amazing, Karen, but this one is a real stunner. I love all those ribbons, and would be so excited to win them. The little barrettes are also super cute. That Poppy Print ribbon is so pretty!! Talk about a beautiful hair bow! My granddaughters would love these patriotic hair bow and barrettes. Love these pretty red, white & blue creations! What a great bow! I love the center piece! Hope you had a wonderful Mother's Day! What a gorgeous Patriotic hair bow and barrette set. Love them!! 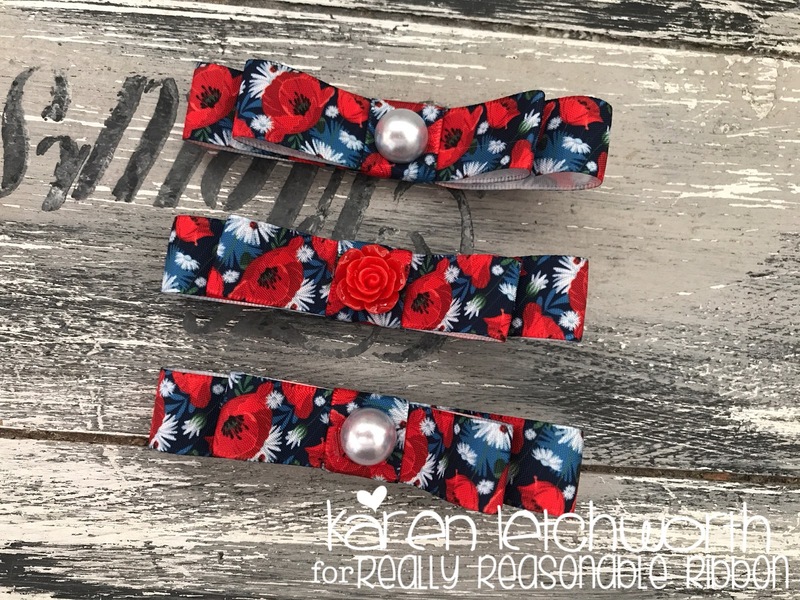 Karen, these barrettes and ribbons would be perfect for this week's Royal Wedding dressup!! Such beautiful work! Who would not be proud to wear these beautiful hiar accessories they are gorgeous tfs.